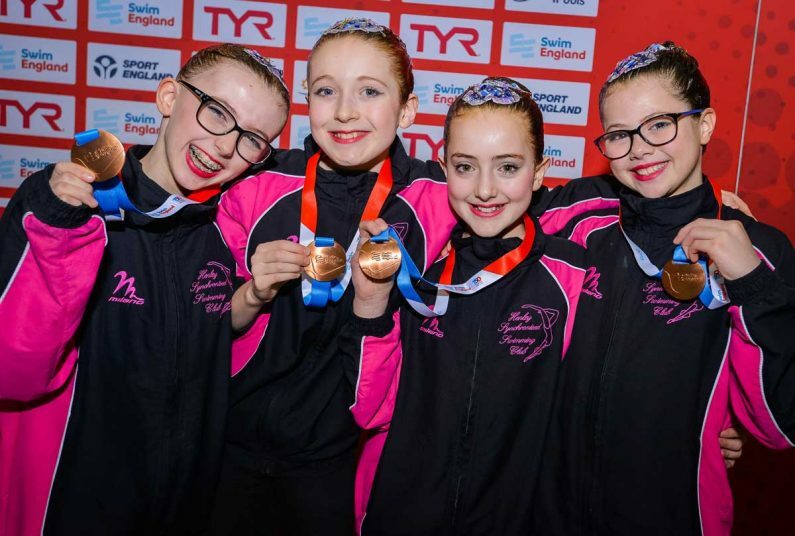 The 12 and Under squad from Henley Synchro Club have had an amazing weekend of results at the National Age Group Competition 2019 held at the Manchester Aquatics Centre 2-3rdMarch 2019. Henley entered all categories – the compulsory figures, 3 solos, 1 duet and 1 free combination team. Following on from their success at the 2018 NAGS, the members of the squad, Annie Skaanild, Emma Buckley, Eva Narewska and Zara Warren have been preparing for this competition since December. They and their coach Mikki Carter embarked on an ambitious plan which included extra water time, gym workouts, stroke analysis, injury prevention workouts, flexibility and sessions with a nutritionist and a sports psychologist. Their hard work and focus showed in their figure results on the Saturday morning with Eva placing 4th, Zara placing 5th, Annie placing 22nd and Emma placing 24th in the country. Emma and Eva swam the duet to “Electric Pow Wow” by “A Tribe Called Red” which is dubstep-influenced dance music with elements of First Nations music, particularly vocal chanting and drumming. They tried to show the theme through quirky movements and different facial expressions. The duet have worked on angles, pool coverage and swimming closely together. The swimmers have added strength training at the gym and more speed swimming to keep up the tempo throughout the routine. The duet was awarded the bronze medal. Sunday morning was the solo competition and Emma, Eva and Zara all swam. Zara’s solo is to Winter by Vivaldi. Classic music was chosen to show her sophisticated personality. Zara is very strong at stable leg height which we have tried to show through a range of movements such as her barracuda to vertical hold and spin, she has some leg switches which are challenging her stable height ability. Winter has different tempos which has been a great learning curve for Zara to show many different emotions with her face and posture. Eva is performing to “Once upon a December” from “Anastasia”, a Fox animation about the lost Tsar princess Anastasia. The song itself is remembering a happier time with family which can be bitter sweet. These emotions have been a great challenge for Eva to depict. Eva is very creative and has come up with much of the choreography herself. Eva’s specialty is barracuda thrusts and splits which we have tried to add into longer figures. Emma is swimming to the “pink panther” partly to show her catlike flexibility and partly to show her cheeky personality. This is her second National championship performing this solo, so she has been working on being higher and more precise in all movements while keeping a fun, energetic performance. Sunday afternoon was the Free Team competition. The 12U swam their yoga routine. We came up with a yoga routine concept last year as our 12 and under swimmers showcase great flexibility, the swimmers also love their yoga sessions at club. This is the second time this routine has been swum at nationals age groups with the same swimmers, with some choreography tweaks and many hours worked on technique we are hoping for an improved score from November 2018. The team have increased their training this year and as a result have achieved massive improvements with the help from coaches at the Henley swimming club to improve their timed swims, all four swimmers now train in the gym 3 times a week and have taken on more pool time. This is with the aim to improve their height, extension, core strength and stamina to achieve better execution and difficulty scores in the routine. The athletes are great friends, have been training together for years and are hoping their bond will show in their performance. The team won the bronze medal. These are unbelievable results for our small club! Henley Synchro Club has been improving every year since we re-entered the competition side of the sport. 2013 – our first year of competing saw us place last in all three teams at the recreational NAGS. 6 years later we are the 3rd best 12U team in the country and two of our athletes ranked in the top 5 in the country! The coaching team of Karen Bennett, Claire Burnett, Emma Hobson and Bron Warren have been led by head coach Mikki Carter in this fantastic progression for our club. We have been very lucky to have the support of the manager and staff at the Henley Leisure Centre, Miles and Joyce (ex GB swimmer and ex GB coach) from the Henley Swimming Club have helped with stroke improvement, Jaime Carter (ex GB gymnast) has provided flexibility and strength programmes, Laura Elliston (LPPT) supplied advice on fuelling a body for excellence and Katie Hooper (ex-Commonwealth bronze medallist) to aid the athletes in their psychological preparation. We are currently looking for sponsorship to help the club with kit, further training and coaching opportunities. Please contact Karen at admin@henleysynchronisedswimmingclub.orgfor further information. We will be holding a trial session for 6-7 year olds on Sunday March 31st 2019. Please register your interest by emailing synchro@henleysynchronisedswimmingclub.org.